Lugosi: Hollywood's Dracula uncovers the life and career of legendary actor Bela Lugosi, examining his early life in Hungary and Germany through his Hollywood successes and eventual decline. The film features a vast array of never-before-seen footage of the actor, ranging from remains of his 1918 film Struggle for Life to behind-the-scenes home movies on the set of RKO Studios. Lugosi is peppered with dozens of rare films clips and photographs, with the story itself coming to life thanks to the vast array of on-camera interviewees. Legendary directors Robert Wise and Joseph H. Lewis, producer Howard W. Koch, makeup man Harry Thomas, and actors like Louise Currie, Loretta King, Helen Richman, David Durston, etc. 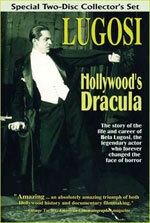 bring to life the film career of Lugosi. And his close friends Richard Sheffield, Ruth Sheffield, Bob Shomer and others explain the personal life of the screen's Dracula. Lugosi's final wife Hope Lininger also appears in what would be the only filmed interview she ever gave. Lugosi costar Robert Clarke synthesizes all of these parts into a coherent sixty-minute documentary with his voiceover narration. Lugosi: Hollywood's Dracula has played theaters and film festivals around the world and has been covered by CNN, NPR, The Hollywood Reporter, and many other publications and newspapers. This special edition DVD includes approximately 30 minutes of deleted scenes from the documentary (with introductions designed by Gary L. Prange), including both choice scenes of Lugosi films and rare, previously-unseen footage. The DVD also features all remaining Hungarian film footage of the actor, a beautiful and uncut 1932 filmed interview, a 1949 television excerpt, and extended interview sequences with Lugosi pal Richard Sheffield and Lugosi's last wife Hope Lininger. The disc is in the NTSC format and has no regional coding. BONUS: Included with the DVD is a 75-minute compact disc featuring clips of Lugosi on The Baker's Broadcast, Command Performance, Mystery House, The Fred Allen Show, and a restored WWII interview of Lugosi discussing politics. These recordings are completely unique to those on the soundtrack album (sold separately). The soundtrack, which is also available from our ONLINE ORDERING SECTION, includes recreations of musical themes associated with the actor, as well as new compositions by Grammy winner and seven-time Grammy nominee Art Greenhaw.